Aside from a few common physical characteristics that we share, I often find my daughter’s similarities to me to be among her most difficult traits. As much as I am proud of her for so willfully being her own person, it makes her a difficult child to parent especially when we’re both so determined to have our own way. Similarly disturbing to me is her sensitive nature which runs the gamut between unfailing kindness at the cost of her own happiness to pissed off trucker mouth railing against the world and all the perceived injustices within it. 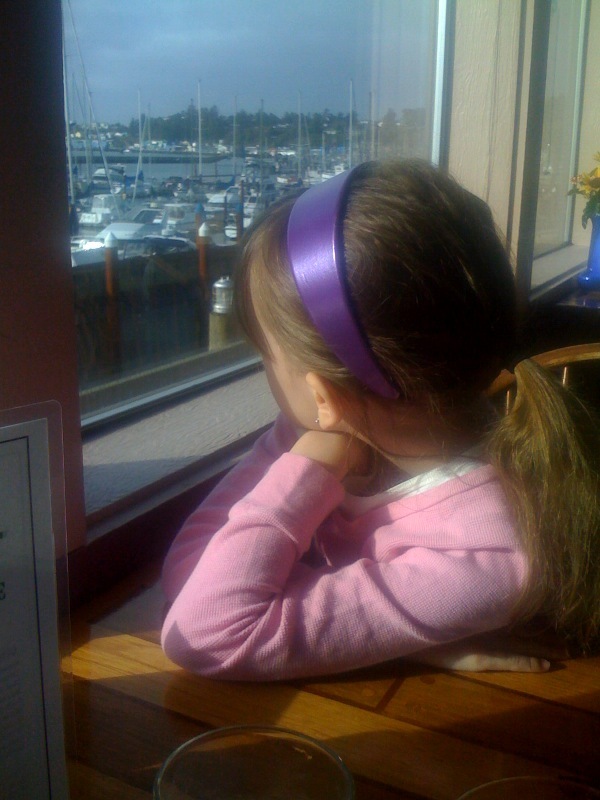 Her complete preoccupation with her own reflection is another tell tale trait of mine, though since she’s still a kid and most children grow out of that phase, I’m holding out hope that her narcissism will come to an end more swiftly than mine. Tonight though, over dinner, just the two of us, K shared with me her new love. We were already having kind of a special night, she and I, but as she began telling me about her poems and then began arranging words on the spot, my heart melted more than a little. Since before she could read or write K has loved telling stories. She would have me write them down for her when she was 3 years old and would ask me to read them back to her over and over again as she corrected her meaning or the name of some bunny that was off on an epic adventure. But until tonight the story, not so much the words, has been the important thing. She’s always loved poetry. I started reading her poems long before she should be able to remember them, and it seems to have stuck with her. She told me tonight that she’s no longer satisfied with telling stories or poems that rhyme, “They’re nice and all but sometimes it’s hard to say what I mean if the words have to sound the same”. I asked her why she thought she liked writing poetry so much and she told me she’s pretty sure it’s because she’s my daughter. Pretty sure that I love words so much that she got it from me. That was the first of two times my darling little girl made me cry this evening. Happy tears. Proud. Full of joy. She’s been having a bit of a tough time lately, and though I know what the problem is, at the moment there’s nothing I can do to fix it. All I can do is be there to talk to her and let her talk to me. We seem to be getting pretty good at it. Between that and our shared love of boots, I think K and I are going to be just fine. Sounds like you are in for a bumpy ride. You will be raising another version of yourself. If she turns out as well as you did it will be worth the effort. Just remember to take a deep breath before you say anything. You were worth the aggrivation! I don’t have the perspective that your mom does *(hi Cami’s mom!) but yeah, I’d say as a friend you’re worth almost any amount of aggravation, so the more K takes after you, the better you guys will have done. Loved, loved, *loved* this post. And love you guys.